Kevin de Bruyne and Jan Vertonghen both scored as Belgium came from behind in Brussels to end a run of 12 successive defeats against Italy. Antonio Candreva put Italy ahead in the third minute but Tottenham's Vertonghen headed an equaliser and Manchester City winger De Bruyne lobbed in the second. 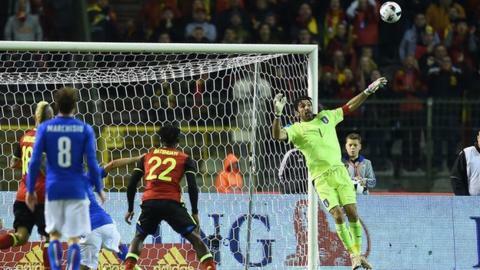 Michy Batshuayi claimed a third to seal Belgium's fifth win over Italy. There was a minute's applause in memory of the 39 fans who died before the 1985 Liverpool-Juventus European Cup final. Belgium went into the game as the number-one ranked team in the world and enhanced their billing as one of the favourites for Euro 2016 next summer with an impressive performance. The home side fell behind after three minutes when Liverpool keeper Simon Mignolet saved well from Southampton striker Graziano Pelle but was beaten by Candreva's follow-up. But Vertonghen headed the equaliser from a De Bryune corner 10 minutes later, his first goal of the season. Belgium were missing injured Manchester City captain Vincent Kompany but went ahead in the 74th minute when City team-mate De Bruyne lifted the ball over Italy keeper Gianluigi Buffon after he had saved from Batshuayi. Substitute Batshuayi then completed the scoring from close range seven minutes from the end. Belgium coach Marc Wilmots said: "The spirit of the group is perfect. Collectively we kept our cool, came back, and won." Match ends, Belgium 3, Italy 1. Second Half ends, Belgium 3, Italy 1. Attempt missed. Michy Batshuayi (Belgium) left footed shot from the centre of the box is high and wide to the left. Assisted by Kevin Mirallas. Foul by Jason Denayer (Belgium). Stefano Okaka (Italy) wins a free kick in the attacking half. Foul by Toby Alderweireld (Belgium). Substitution, Italy. Andrea Barzagli replaces Leonardo Bonucci. Attempt saved. Stephan El Shaarawy (Italy) right footed shot from the centre of the box is saved in the centre of the goal. Assisted by Stefano Okaka with a through ball. Luca Antonelli (Italy) is shown the yellow card for a bad foul. Foul by Luca Antonelli (Italy). Substitution, Italy. Luca Antonelli replaces Mattia De Sciglio. Substitution, Belgium. Kevin Mirallas replaces Yannick Carrasco. Attempt missed. Michy Batshuayi (Belgium) header from the centre of the box misses to the left. Assisted by Jan Vertonghen with a cross. Goal! Belgium 3, Italy 1. Michy Batshuayi (Belgium) left footed shot from the left side of the box to the bottom left corner. Assisted by Yannick Carrasco with a through ball. Corner, Belgium. Conceded by Matteo Darmian. Attempt missed. Stephan El Shaarawy (Italy) right footed shot from the left side of the box misses to the right. Assisted by Simone Zaza. Substitution, Italy. Simone Zaza replaces Éder. Substitution, Italy. Stefano Okaka replaces Graziano Pellè. Substitution, Italy. Stephan El Shaarawy replaces Alessandro Florenzi. Corner, Italy. Conceded by Simon Mignolet. Attempt saved. Graziano Pellè (Italy) header from the centre of the box is saved in the bottom left corner. Assisted by Alessandro Florenzi with a cross. Corner, Italy. Conceded by Jan Vertonghen. Goal! Belgium 2, Italy 1. Kevin De Bruyne (Belgium) left footed shot from the centre of the box to the bottom left corner. Attempt missed. Axel Witsel (Belgium) right footed shot from outside the box is too high. Assisted by Kevin De Bruyne. Axel Witsel (Belgium) wins a free kick in the attacking half. Foul by Graziano Pellè (Italy). Attempt blocked. Leonardo Bonucci (Italy) right footed shot from outside the box is blocked. Attempt blocked. Alessandro Florenzi (Italy) right footed shot from outside the box is blocked. Foul by Radja Nainggolan (Belgium). Roberto Soriano (Italy) wins a free kick in the attacking half. Offside, Italy. Mattia De Sciglio tries a through ball, but Antonio Candreva is caught offside. Substitution, Belgium. Jason Denayer replaces Luis Pedro Cavanda. Substitution, Belgium. Michy Batshuayi replaces Romelu Lukaku.